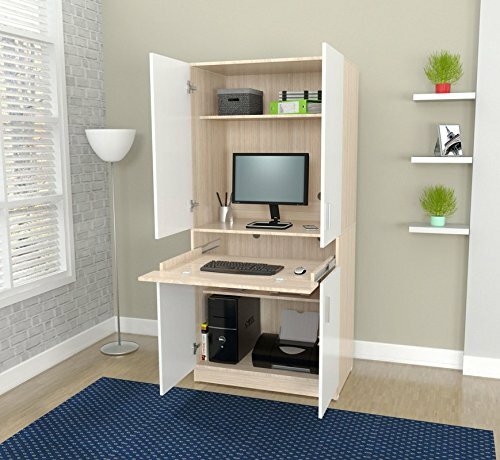 Computer armoire-White has a functional modern two toned design, a sleek finish to give your dÃ©cor just the right touch of elegance and is an excellent choice for your home office. It features four (4) doors with metal handles, four (4) shelfs for storage and one (1) slide out keyboard shelf. Laminated on all sides with durable melamine which is stain, heat and scratch resistant. Made out of solid composite wood. All decorative accents are not included. Overall- 67.3'' H x 31.5'' W x 20.3'' D. Shelf- 8'' H. Overall Product Weight- 129.6 lb. Assembly Required. If you have any questions about this product by GAShop, contact us by completing and submitting the form below. If you are looking for a specif part number, please include it with your message.